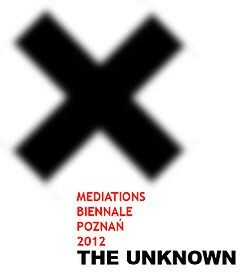 Beside the exhibition of Mediations Biennale, the important item of the agenda is the conference The Unknown – Niepojmowalne, realised by Fundacja Mediations Biennale in cooperation with Uniwersytet Artystyczny in Poznan. During three sessions the curators of Mediations Biennale will give presentations: Denise Carvalho (Brasil, USA), Friedhelm Mennekes (Germany), Fumio Nanjo (Japan) and Tomasz Wendland (Poland). Also artists: Alex Villar (Brasil), Lenore Malen (USA), Heather Dewey Hagborg (USA), Piotr Kurka (Poland), Grzegorz Klaman (Poland) among others and theoreticians: among others Hyun Jeung Kim (Korea), Paz Moreno Feliu (Spain), Kimon Morley (Great Britain/Korea), Jörg Scheller (Switzerland), Shaheen Merali (Great Britain) will take part in discussions. A Symposium on the Limits, Blind Spots, and Dark Fields of Large-Scale Exhibitions of Contemporary Art. An initiative which gathers journalists from all over the world: from Germany, Switzerland, Slovakia, Israel, Brasil, South Korea, Great Britain and USA. Ever since the 19th century, recurrent large-scale exhibitions such as world fairs, biennials, art fairs, or the documenta have not only incorporated more and more artworks from all over the world, but have also included the urban, sometimes even the rural space. After the fall of the Iron Curtain, the absorption of visual art into everyday life has accelerated along with the global proliferation of biennials and the global expansion of the art market. Today, large-scale exhibitions appear as testimonies of the “pictorial turn” (W.J.T. Mitchell), as epitomes of a materialist world in which everything is constantly “on display” – art, commodities, politics, users of social networks, etc. Particulary the new European biennials of the post-colonial and the post-communist era have emerged as instruments to market the unmarketed, to map the unmapped, to show the unshown, to make known the unknown – unknown artists, unknown regions, unknown dicourse, et cetera. In general, art biennials aim at extending the “overt world”, as opposed to the “covert world”. What kind of art experience is possible, and which kind of art experience is impossible in the context of large-scale exhibitions? Does large-scale exhibitions distract us from engaging with artworks in a reflective, sustainable manner? Large-scale art exhibtions are often referred to as “laboratories” or as sites of “artistic research”. But what specific types of knowledge and insight do large-scale exibitions bring forward? Can their excess of visibility also be considered as blinding, thus creating opaque spots rather than transparent fields of knowledge? Is it actually possible to adress “the unknown” precisely by a large-scale exhibition which, historically speaking, has rather been linked with materialism (e.g. world fairs), tourism (e.g. biennials) or knowledge production (e.g. documenta)? How does globalized contemporary art, arguably the main focus of all biennials, deal with “the unknown”, that is, with the mystic, the non-graspable, the irrational?